There’s a sub-genre I call “premature interstellarism”, stories about unfortunate explorers and colonists whose toolkits are, alas, not up to the challenge of exploring or settling other planets. Given the long history of failed colonization efforts on Earth, the planet on which we actually evolved, the idea that some colonization efforts would fail seems like a no-brainer. 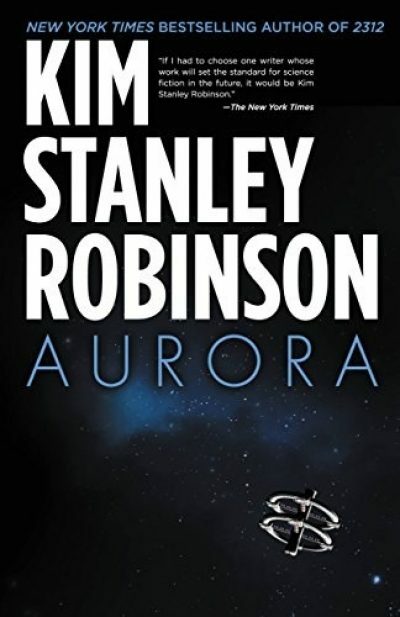 2015’s Aurora is an example of such a book, standing next to such works as Poul Anderson’s “The Alien Enemy,” Joanna Russ’ We Who Are About To…, and Brian Stableford’s Daedalus series. It’s a rare book that fits into just one possible sub-genre. There is a far larger, more important sub-genre to which Aurora belongs and that’s Books with Idiot Plots. Trigger warning for physicists and biologists: this is supposedly hard SF, which is to say SF that provides enough technical detail that the reader can be certain that various mechanisms and events couldn’t work the way the author has them working. Also, spoiler warning. One hundred and sixty years after setting out from the Solar System, an aging generation ship approaches Tau Ceti. Nobody currently living on the ship belongs to the generation that made the decision to set out for another stellar system. They are their descendents. Some, like Devi, are quite rightly resentful of the dismal hand dealt them by their ancestors. Since the ship has a mere two thousand (or so) people, its skilled worker pool is by definition rather shallow. Moreover, aside from Devi, the skilled workers are only of average intelligence. The first generation may have been made up of the brightest Earth had to offer1, but not only is the population subject to reversion to the mean, but more horrifying, the IRON LAW OF ISLAND BIOGEOGRAPHY!!!! means that the population is sensibly diminishing in height, mass, and in the case of Devi’s daughter Freya, intelligence of the sort Devi values2. By the time the ship arrives in the Tau Ceti system, Devi (and her oh-so-useful skill set) is long dead, leaving the task of colonizing an alien system to Freya and the rest of her generation. It quickly becomes apparent that the task is going to be a challenging one. The primary target world is a large moon (of approximately the same mass as Earth). The humans dub it Aurora3. The world is life-bearing, but that life includes a lethal pathogen for which the colonists have no cure, and no means to develop one. The generation ship has reached its Garden of Eden, but the garden is guarded by angels in pathogen form. The prognosis is grim. The colonists could try to establish self-sustaining colonies on the lifeless worlds of the system, but their tiny population means that not only do they lack the full roster of skills that would be needed, but they are also too few to weather the inevitable setbacks. There’s a slim chance that they could flourish—but they could even more easily turn out to be as doomed as Roanoke. Or, they could undertake a desperate voyage back to the one planet known to be able to sustain human life indefinitely. OR, the ship’s government by (self-selecting) committee could fail to reconcile all the conflicting agendas and factions; the whole effort could devolve into civil war in a fragile artificial habitat. I will give Robinson points for the generational conflict aspect of the book. Not so much the Devi/Freya stuff (which, for the record, I did find plausible), but the fact that it is one thing to volunteer to spend your life on a generation starship and quite another thing to know that you’re stuck living in one because of decisions your great-great grandparents made. I am also kind of impressed that despite having only about two thousand people on board, the ship managed to maintain a fairly diverse array of cultures rather than becoming a deep space emulation of Royston Vasey. I would imagine that such paranoid, inbred isolationism would be the endpoint of most generation ship communities5. So, there’s my praise for the book. Now [rubbing hands] for the hard-hitting critique. The totally ineffective critique, since I know from past experience that I am in the distinct minority where Robinson’s terrible books are concerned. I could not decide what the biggest problem with this novel might be … and then realized that there are several problems, of equal weight, which react upon each other synergistically. That resulted in a total failure of SOD (suspension of disbelief), for me at least. The first problem I noticed was the staggering lack of curiosity evinced by the characters. You would think as arrival at Aurora approached, the two thousand colonists would be obsessed with finding out more about the new and alien world, and drafting scenarios to deal with any obvious problems. None of that happens. Moreover, this weird disinterest in the world around them isn’t limited to the latest generation. Until Devi made the effort, nobody had ever bothered to talk to the ship’s AI. WTF??? Heck, all of humanity seems to have dropped the ball. Towards the end of the novel, the colonists kitbash effective, durable hibernation gear from the stuff they just happen to have brought with them. How is it that a few semi-educated, not-so-bright colonists can invent hibernation technology at what amounts to the drop of a hat, with limited materials … yet the Solar System, which has billions of people and a technological base in every way superior to that of the ship, hasn’t managed to duplicate this feat? How is it that nobody, in the centuries since interstellar colonization began, has ever bothered to research hibernation technology, if it’s that dang easy? This tech would be an immense improvement over the desperate kludge of generation ships. For that matter, hibernation tech would have immediate applications on Earth and elsewhere in the Solar System. Nor do the Earthlings seem to use the tools they do have all that effectively. We are told that they can send probes to other stellar systems, and that they have very advanced robotics. Why wasn’t the ship preceded by a small, fast probe? The probe could have released self-printing robots which would then build orbital habitats to receive the colonists. Such habitats would also allow the crew to survey the system in greater depth before landing settlers. Some reviewers may focus on how quickly the colonists give up on Aurora, but given how few people they have, that may well be a sensible decision. Small communities are extremely vulnerable to set-backs. This particular one has the issue that it has first-world birth rates, which means that maintaining its current population level may be a challenge, even if there are no mass die-offs. Robinson decided to have the ship launched by a fairly successful solar civilization, which means that many of the issues the ship is dealing with should have already arisen, and been solved, centuries ago. If humans were going to settle on Mars or Titan, they would need to develop a toolkit for settling hostile planets. Yet none of the colonists seems to know anything about such a toolkit. Unless of course all that information was sitting in one of the files nobody but Devi ever bothered to read. I will let some other reviewer wrestle with Robinson’s discovery of the IRON LAWS OF ISLAND BIOGEOGRAPHY. Well, except to say that six generations seems kind of short for selection effects to start gaining the sort of traction Devi thinks they have gained. Also, you’d think that the ship’s medics would use the awesome technology of tomorrow to compensate for those selection effects. Although, only two thousand people, so their best medics may not be that great. No, I would like to talk about the hilarious orbital mechanics we see towards the end of the novel6. For various reasons, [spoiler] the returning ship arrives in the Solar System having shed all but 900 9000 kilometers per second of their interstellar speeds and all but a few dregs of fuel. To shed that last 900 9000 km/s, they carry out a twelve year careen around the Solar System, using a combination of gravitational manoeuvres, rocket propulsion, magnetic braking, and aerobraking to dump the last of their unwanted velocity. The thing is, if their first pass by the Sun doesn’t leave them with less than Solar escape velocity, none of the other bodies in the Solar System should be able to change their orbit enough to keep the ship from heading back off into the interstellar deeps and it’s a plot point that the ship does in fact end up heading off back into the dark and deep. And don’t say “well, maybe the aerobraking you mentioned let them turn tighter turns around each planet” because that only gets us to the question of how aerodynamic, exactly, would an extremely unaerodynamic starship designed for the interstellar deeps be? Added later: I misread the ship’s inbound velocity as .3% C due to a flyspeck on the page and because after early braking it is moving at. 3%. When it first approaches the Sun, the ship’s velocity is actually 3%. Whoops. Sadly, this only makes the plot less plausible. And that’s not even getting into how they are able to mine the atmospheres of the worlds they are flitting past. Which they do. Aurora felt to me like a revival of the Mundane SF movement of a decade or so ago. It suffers from the same basic problem that Mundane SF did: the basic idea isn’t necessarily flawed, but all too often, the author is far too ignorant to carry it off competently. The results are usually hilarious, but inadvertently so. Aurora is available from Orbit. 2: Freya does seem to have some problems with math, but it’s not so much that the ship is crewed by the Marching Morons (yet) as that Devi was kind of an awful parent. Freya’s dad is less critical and more supportive of his daughter, who goes on to have about as useful and rewarding a life as she could under the circumstances. 3: Not to be confused with the life-bearing, huge moon Aurora from the role-playing game 2300 AD, which I think was located in a different stellar system. The name as used in the KSR novel may be a hat tip to Asimov’s The Naked Sun, which also featured a habitable world called Aurora in the Tau Ceti system. 5: It’s kind of a shame that KSR’s depiction of those societies is perhaps not as nuanced as it could be (even an Analog author would be able, if they did even a smidgen of reading or research, to distinguish between the cultures of “Inuit or Sami, or for that matter Neanderthals”). Apparently KSR never took anthro in college or if he did, didn’t pay attention; IMHO, he is ignorant of the subject to a degree that makes Jerry Pournelle look like Franz Boas. At least this book didn’t have obligately murderous Muslims, unlike Red Mars. Or the LiveAid view of Africa from 2312. At first they said Aurora had no tides, being tidally locked to Planet E and thus always tugged by it in the same direction, but now there were some people in the settlement who thought the combination of Tau Ceti and Planet E might tug a bit harder on Aurora in the direction of Planet E, while when Tau Ceti was on the other side of Aurora, the contrary tugs of Planet E and the star would shift the water covering most of Aurora in ways that could be seen. So, interesting facts about tides: they scale directly with the mass of the object orbited and with the inverse cube of the distance between the planet and star or planet and moon. Tau Ceti has 78% of the mass of the Sun and Planet E (and Aurora) orbit at 0.55 AU, just over half the distance between the Sun and Earth. A quick back of the envelope calculation shows that the tides Tau Ceti raises on Aurora should be almost five times the size of the tides the Sun raises on Earth. That is very roughly half again the value of lunar tides on Earth. How is there any doubt that Aurora is subject to tides?